Following the devastating fire at Notre-Dame in Paris, how well prepared are cathedrals on this side of the Channel for a fire? "Any fire in an historic building has the potential to be devastating," said Becky Clark, the Church of England's director of cathedrals and church buildings. "The priority is always to prevent fire in the first place, by using professional buildings services specialists to carry out electrical and hot works [any works that could cause fire] and having regular inspections." Historic buildings have to be inspected regularly just like more modern structures. Sprinkler systems may not be suitable because they tend to be set off by heat, and in cathedrals the ceiling would be so high up that, by the time the heat triggered the sprinklers, a fire would be out of control. Martin Kealy, a fire consultant and managing director of MKA Fire, says that on the whole, such buildings pose a relatively low fire risk, because most of the materials at ground level are things like stone floors and very thick timber pews, which would not easily ignite. Things like tapestries and artwork on the walls would burn faster, but they would be unlikely to set off the fabric of the building. That is why a point of higher risk is when renovations are being carried out, which means additional combustible materials (such as the platforms on scaffolding) and more things that could start a fire are present, and the building's fire protection systems may be temporarily offline or even removed. But Mr Kealy stressed that existing regulations do not necessarily focus on the historic buildings themselves. "It should be noted that modern building regulations and fire safety standards are designed to protect people and not buildings," he said. That means that any measures to protect the building would be beyond the requirements of the fire regulations. In addition to the safety of staff and visitors in historic buildings, the fire regulations are also concerned with the safety of firefighters. "We work closely with the Fire Brigade and other emergency services to ensure they have safe access to deal with any issues, including exercises to remove the cathedral's priceless artefacts to safety," said Jim Morley, chief constable and fire manager at Canterbury Cathedral. Becky Clark confirmed: "Cathedrals will have salvage lists of moveable artworks and other treasures which the Fire Brigade can work through if the site is safe enough, meaning that the most precious parts of the collections stand the best chance of being saved." 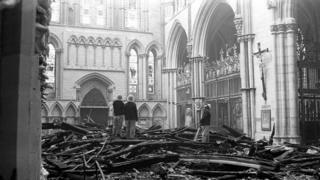 Even when there are not renovations under way, the roof is vulnerable to lightning strikes, as happened with the York Minster fire in 1984. There has clearly been hefty inflation in the cost of repairing historic buildings, with the work on York Minster costing £2.25m (about £7m today) while the repairs to Windsor Castle following its 1992 fire cost £36.5m (about £74m today). The fund for repairing Notre-Dame has already passed €800m (£700m). The costs of improving fire safety at UK cathedrals is usually left to their own fundraising efforts, although several of them used money from the £40m First World War Centenary Cathedral Repairs Fund to pay for work to reduce the risk of fire. The fire in Paris has prompted some MPs to warn about the risk of fire in the Palace of Westminster. They are due to move out of Parliament in 2025 to allow for renovations that are estimated to cost £3.6bn.